The Toronto Raptors have come out strong this season. They’re integrating Kawhi Leonard in nicely, continuing to develop their young players and Coach Nurse has also been solid. Right now the Raptors have the best record in the league at 17-4. Being the best through 21 games only means so much. The Raptors want to be the last team standing in June. Subpar post seasons have plagued this team long enough, what makes the Raptors legit contenders? Kawhi Leonard is a beast on defense (and always has been!). He is great at rotating and being a part of team defense, but more importantly Kawhi can shut down guys one on one. Kawhi’s defensive instincts are amazing, he combines his strength and stays balanced on his man. Most of the time that allows Kawhi to defend without fouling. In Sunday’s 125-115 win over the Miami Heat, Leonard stole the ball from Dwyane Wade with 2:30 left to play in the fourth. Kahwi didn’t foul Wade, he played great defense, got on the floor for the ball and soon after Pascal Siakam got a layup. When your best player dives and hustles for the ball, that inspires the whole team. The Raptors are a deep team and Kawhi has continued to show his greatness by making winning plays. Nick Nurse often goes 10 deep with this roster. If the Raptors blow out a team he’ll go even deeper into his bench. While the rotation will tighten up later in the season and in the playoffs, having confidence in the bench is huge. It lightens the load on the starters and keeps guys ready if there are injuries. Coach Nurse continues to tweak which guys play together and having the luxury to bring Serge Ibaka or Pascal Siakam off the bench is awesome. The Raptor bench does sometimes struggle to initiate offense as there aren’t tons of guys who can create for themselves. That’s why Leonard or Lowry often play with the second unit. CJ Miles drove and finished inside with his off hand in the win against Miami, but Miles, Vanvleet and Anunoby don’t often look to create their own shots. That’s why they run high pick and rolls or drive and kick. Those plays work against weak defenses where guys don’t rotate well, but can be predictable against better D. If Nurse keeps either Lowry or Leonard on the floor with the second unit, the Toronto Raptors bench could easily the be the most reliable one in the NBA. Pascal Siakam really should get an endorsement from Energizer; he’s the Raptors Energizer Bunny. 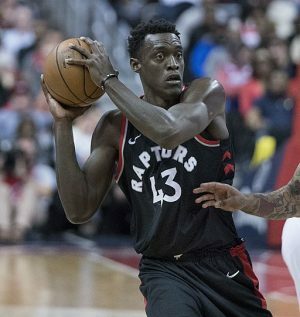 Siakam defends with as much tenacity as anyone, stretching his long arms out against his man and in the passing lanes. Raptors Republic compared Siakam to Thaddeus Young in his early days. Pascal is any coaches dream: he fills the stat sheet, while remaining efficient and consistently making an impact. Siakam is in his second season and has made major strides with his game already. His current true shooting percentage is at about 69%, according to Basketball Reference. He’s the Toronto Raptors fourth leading scorer and he’s hitting over half of his shots! Pascal will likely cool off a bit, but if he can stay close to those numbers, that would be monumental. Leonard and Lowry are expected to lead the team in scoring, but if Siakam can be that third guy all year, that’ll make the Raptors a tough out in the East. The Toronto Raptors currently sit with the second best odds at an NBA Championship this season. But be sure to check in with SportsBettingDime for updates as we’re bound to see some fluctuation as the season pushes on. Raptor nation should expect a trip to the finals this year. Anything less would be tough to fathom. Sure the Celtics can play much better, the Sixers can try and challenge them too, but who’s really better than the Raptors in the East? The Raptors need only continue to make it clear that they’re the best. They are showing out thus far, but the fire must remain lit until June. Gather your wood and stay warm Toronto: there’s a lot to be excited about with the Raptors!